Happy Monday! I hope you had a fabulous weekend! 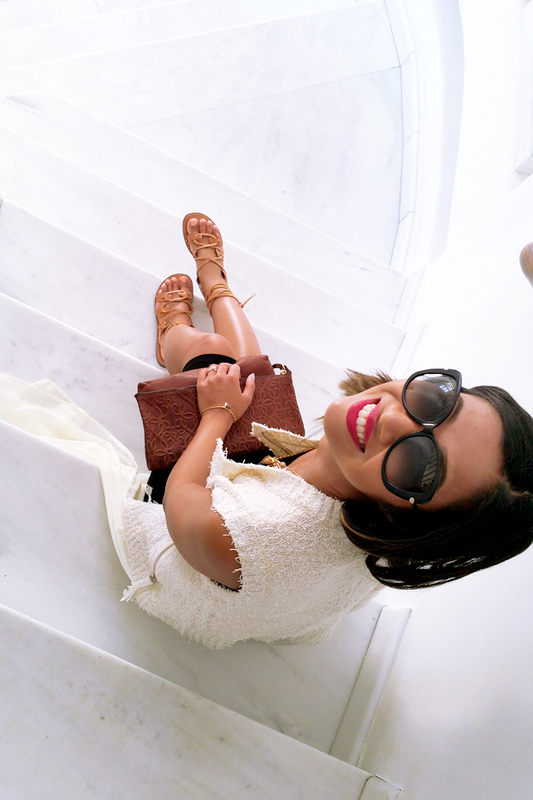 Hard to believe that less than two weeks ago I was roaming around Mykonos, Greece in sleeve-less dresses, flowy pieces and strappy sandals. I visited a fabulous Toronto boutique, Sense of Independence prior to my departure to pick up some new pieces for my honeymoon. I ended up with this mix medium sweater vest (along with a few other favourites) and I absolutely love the added chiffon layer that nearly sweeps the floor. It’s an item that is truly unique and perfect for transitional weather. I paired the sweater vest with a basic black ribbed dress and some new accessories I received from ALEX AND ANI to celebrate the launch of their flat rate Canadian shipping offer ($9.95 or free for orders over $75). I’m excited to partner with Sense of Independence to give one lucky winner an electronic gift card valued at $100 Canadian dollars to be spent on their online boutique. I love shopping there because they have SO many great finds and unique labels that are not readily available in major retail stores. A few on my lust list are the RENEE 3/4 Sleeve Print Dress, KERISMA Flowy Open Coat, and KENSIE Buffalo Check Blanket Sweater. Be sure to check out the boutique, free shipping on orders over $100 within Canada and $9.95 across the US! Enter contest to win a $100 Sense of Independence gift card by using the widget below! 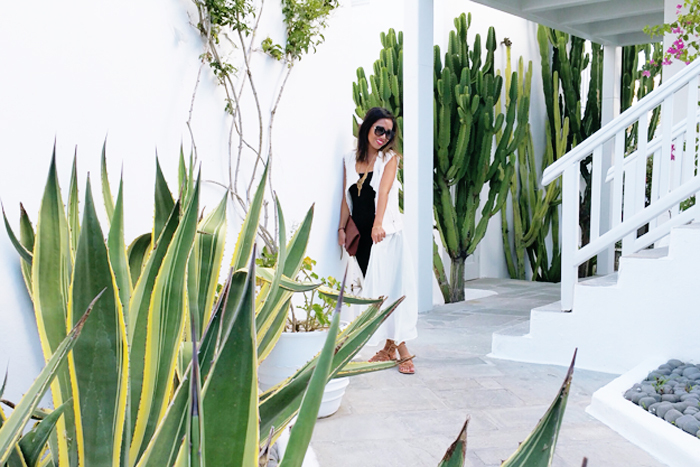 We spent most our time in Mykonos getting lost on the island and finding different nooks and crannies to explore. The island was truly a dream. Mykonos, is most famous of its beaches, architecture, and most of all, nightlife. However, most of the beach parties, nightclubs, and beach bars are already closed for the year in late September/early October, which made the island less busy but incredibly enjoyable for honeymooners like us. We stayed 3 nights at the Belvedere Boutique Hotel which is where these photos were snapped (literally just outside of our hotel room). I’ll be sure to share a full list of travel recommendations soon, so please stay tuned! For now, enter the contest below to win a $100 gift card! Win a gift card valued at $100 Canadian dollars to be spent at the Sense of Independence online boutique. Here is how you can win, enter the draw by using the WIDGET below. Contest is open from Oct 19, 2015 12:00 a.m. EST to Oct 27, 2015 12:00 a.m. EST. This contest is opened to Canadian and United States residents only. Winners will be chosen at random. The winner will be required to provide their contact information and valid Canadian or US mailing address in order to receive their prize. Gift card can only be spent online at www.sensesofindependence.ca. +5 entries by commenting and sharing what you’re clothing item you are hoping to add to your wardrobe. Chunky Sweaters and Pencil Midi Skirts! A nice sweater, it’s getting colder. I’d love a new sweater. It’s getting cold! The distressed moto jeggings are fantastic! I would love to get a pair of those!! I desperately need a new sweater! I’d love a new party dress! I would like to get a jersey dress or basic leggings. I would love a new winter coat! I would love to get a sweater. so many nice ones there! Hoping to buy a new sweater for the cooler weather! I love the PLAID TUNIC DRESS form Gentle Fawn! I hope to get a new coat or dress! Love the folder over clutch in your post. I could use one of those! I would love a sweater for layering. I’d like to get one of the sweaters. I’d love to add a beautiful, stylish winter coat to my wardrobe! One that is chic yet still warm to wear to the office. A soia and kyo coat! I need a cute new Fall sweater! I’m hoping to buy a new sweater! I like the sweater dress!